In 2004, Old Faithful Inn welcomed visitors to its one hundredth anniversary season. Constructed beginning in June 1903 and throughout the winter and spring of 1904 by the Yellowstone Park Association, the inn was a boon to park visitors, who had never before had a satisfactory lodging place at the Upper Geyser Basin. And what a place it was! When it was built, it was the largest all-log building in the world. One of the inns—Old Faithful—cannot be matched anywhere in the world. 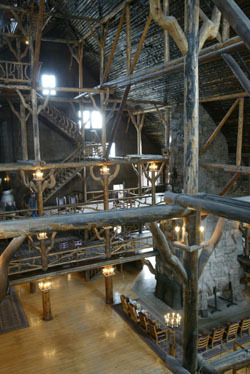 It is a lofty, wide-spreading structure of logs, with a touch of Swiss about its gables and windows. Within, the logs are everywhere—partitions, balustrades, stair-steps, and newel posts—even the drinking fountain is a log. It must have been a mighty task to search the forests for all the queer forms of growth that enter into the construction of the curious, rustic interior. And the lobby, with its four great cheerful fireplaces, its huge corn popper, its clock and twenty-foot pendulum, and all the log-made galleries above it— that charms and comforts beyond the power of words to tell. From very early childhood, I have kept fond memories of the inn. Here are some of them. My father, L. Worth Orvis, served as transportation agent in the inn for four years, until World War II closed most park facilities. I remember him at the inn’s porte cochere, calling the passengers’ names through his big red megaphone as they entered the yellow buses for tours of the park. My mother, then Margaret Inabnit Orvis, played piano and drums in the Billings-based Ladies’ Ensemble for tea time and evening dancing in the lobby during the summer of 1939. Meanwhile, my sister Joan and I played hide-and-seek in the long corridors or sat at one of the charming double desks on the balcony. We were occasionally allowed up to the roof (not generally accessible now), to sit in the S-shaped wicker double chairs near the wind-whipped flags and the big geyser spotlight. I loved the wrought iron clock on the monstrous fireplace and the log cabin mailbox out front where the buses were loaded. 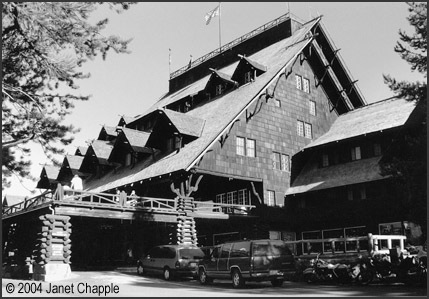 CREDITS: The photo of Old Faithful Inn showing the porte cochere is by Leslie Kilduff, borrowed from page 69 of the first edition of Yellowstone Treasures (2002); the photo of the Old Faithful Inn fireplace from Bat’s Alley is an NPS photo. ON THE WEB: For more about Old Faithful Inn history and the current major renovations, together with pictures, see Frank Markley’s Yellowstone Notebook pages.